The 99.5 Radio Theatre partnered with Theatre Genesis to present this new play to WBAI listeners. 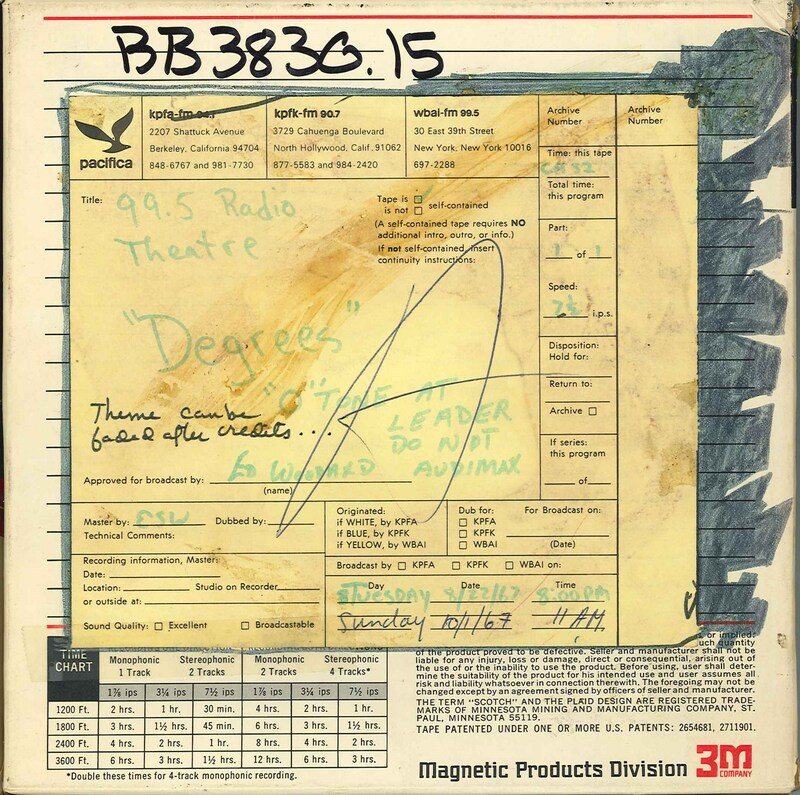 Degrees, by George Birimisa, was first produced in 1966 by the Off-Off-Broadway group at St. Mark's Church-in-the-Bouwerie, and was adapted for 99.5 Radio Theatre by George Birimisa and Charles Lewis. The play deals with the tangled situation confronted by a young New York doctor, his roommate, and a girl. Patrick Sullivan plays Dr. Robert Ginsburg, Dan Leech is the roommate Louie, and Judy Wood plays Sheila. Murray Paskin directed both the original stage production and the radio version. Producers for WBAI are Baird Searles and Charles Lewis, with technical direction by Ed Woodard. 30 seconds of test tone at the beginning of the recording. This recording was formerly cataloged as BB3830.15.